CHICAGO and NEW YORK, January 2, 2018 – Former General Re Corporation President and General Counsel Damon Vocke is joining the Duane Morris insurance practice, the firm announced today. 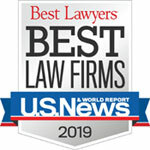 Vocke had most recently headed his own firm, the Vocke Law Group, with locations in New York, Chicago and Stamford, Connecticut. Along with partner Ronald Lepinskas and special counsel Mark Holton from the Vocke firm, he joins a Duane Morris insurance industry practice group that comprises over 100 lawyers in offices across the firm. Vocke will be working with the group nationally and particularly in New York.